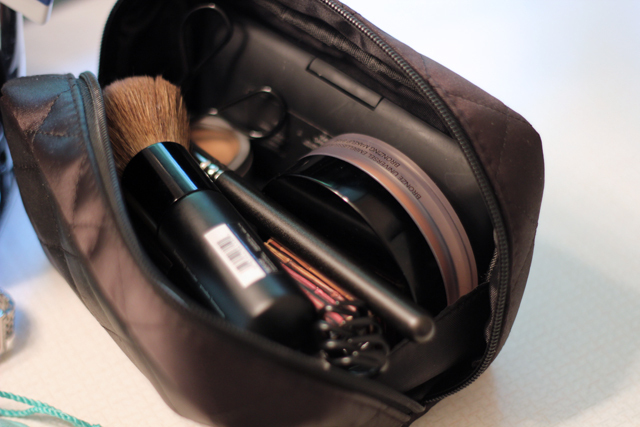 Here's a look at what is inside my makeup bag. Like I mentioned in my previous post, I spent the weekend at Niagara-on-the-lake. This is all the makeup I brought with me. Basically the face I've been wearing lately. Same old, really. Chantecaille Just Skin (in Wheat) has been my tinted moisturizer of choice. I purchased it a few days ago and I've been really enjoying it. I will post something more substantial soon. My new holy grail concealer, Garnier Anti-Dark Circle Roller, was in tow. I always find myself bringing my NARS blush palette, but I'm never just happy with that, so I took my Bare Escentuals blush in Rose Radiance. I cannot forget my Chanel Bronze Universal. I also brought Benefit Hoola for good measure but didn't end up using it. I only brought a couple lip products with me. Surprise, surprise. Dior Addict Extreme in Lucky, Smashbox O-Gloss, and Maybelline Baby Lips. Something for any lip mood. What's your favourite product in your makeup bag right now? NARS Danmari palette, Chanel blush brush, Chanel eyelash curler, PUR Minerals 4-in-1 pressed powder, Bare Escentuals in Rose Radiance, Maybelline babylips, Benefit Hoola, Dior Addict Extreme in Lucky, Quo blotting paper, Garnier Anti-Dark Circle roller, Benefit They're Real, Expressions Bronzing brush, MAC 109, Chantecaille Just Skin, Smashbox O-Gloss, Chanel Bronzer Universal. I will definitely be doing a blog review on the Chantecaille Just Skin, but here's what I think in a nutshell: great consistency, feels lovely on the skin, blends in nicely, hardly any coverage but looks great on the skin. Still on the fence whether it's worth the price tag though. In Canada, it retails for $82 :(. Still so compact for a weekend trip!! How is the Garnier roll-on? I can't wait to see more. This is probably my favourite kind of post! 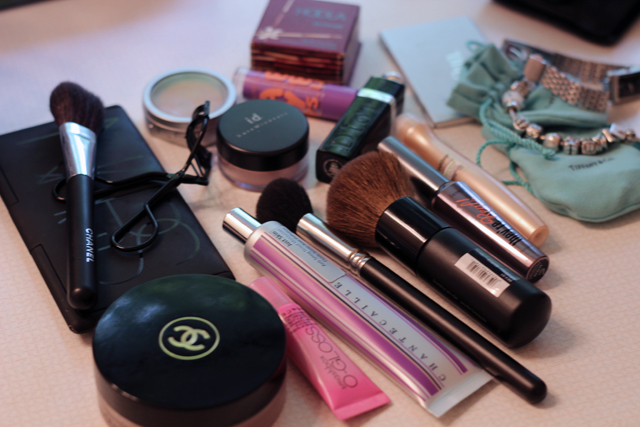 I'm so curious as to what is in other people's make-up bags, haha. I noticed that you didn't take eye shadows with you? I love to know what people have in their make up bags. :) I'm always on hunt for new stuff & this way I get to see what people genuinely love & use daily. Definitly loving watching " what's in my beauty bags"! I do the same thing, pack two of some things "just in case". I'm really bad with the lip products though, I always have so many in my purse for any occasion!